After plenty of buzz, the rapper’s BBC 1Xtra freestyle is finally here. 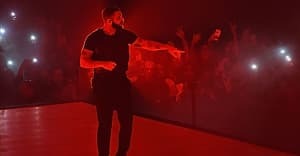 After offering up a freestyle for another UK media outlet Link Up TV with "Behind Barz" just last week, Drake's awaited (and well-teased) Fire In The Booth freestyle on BBC 1Xtra is finally here. Host Charlie Sloth shared a trailer for the event just yesterday on Instagram with any hints, and while some listeners were quick enough to catch and record snippets of the show, the full video is finally here.